If you're not already keenly aware that you should stay well hydrated, you might be a camel. But as card-carrying procrastinators everywhere know, awareness and action are two different things. This water bottle is marked with motivational messages (Keep Going! Getting Close!) to remind you to sip your way through two full bottles of H2O per day. 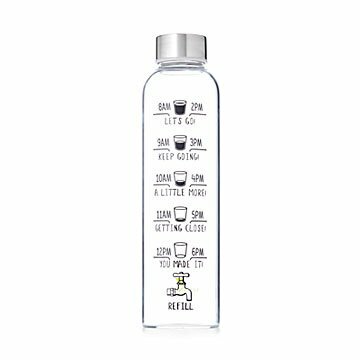 The clear markings and clever graphics on a sturdy glass and stainless steel bottle make this design a friendly hydration helper. Made in China. I would buy this again - going to order one for my sister! This is awesome. I struggled with drinking enough water. Looking at this bottle - it is basically a cup an hour - it simplifies the struggle! And everyday I have used it, I have overachieved what is on this bottle! I forget to drink water and when I do, I only guess how much I intake. It's silly but this helps immensely. I keep two of these bottles at my desk and stay right on track. Love this water bottle! I got it to encourage me to drink more water, and it really works for me. And it makes me smile each time I pick it up. It's a great, sturdy drinking glass and helps keep me on track to be drinking more water regularly. Great way to encourage your coworkers to drink more water. I loved this fun approach to remember to add water throughout the day. The bottle is cute enough you can leave it out if guests are around. I have a variety of water bottles scattered throughout my house but this is the only one that is a conversation starter. I originally bought one for a friend who needs to drink more water and then added one for myself. This truly is a life changer for me. I have tried everything to maintain my water intake, but nothing has worked. This bottle has become my friend! The gentle reminders on the bottle are so encouraging and the levels you need to drink are so easy to do. I stay hydrated and feel so much better - mentally an physically.